By Brittany Lamas Three times a week at 6 a.m., Amelia Hiatt wakes up, gets dressed and walks out of the Castilian in West Campus ready to start her morning with a ride. 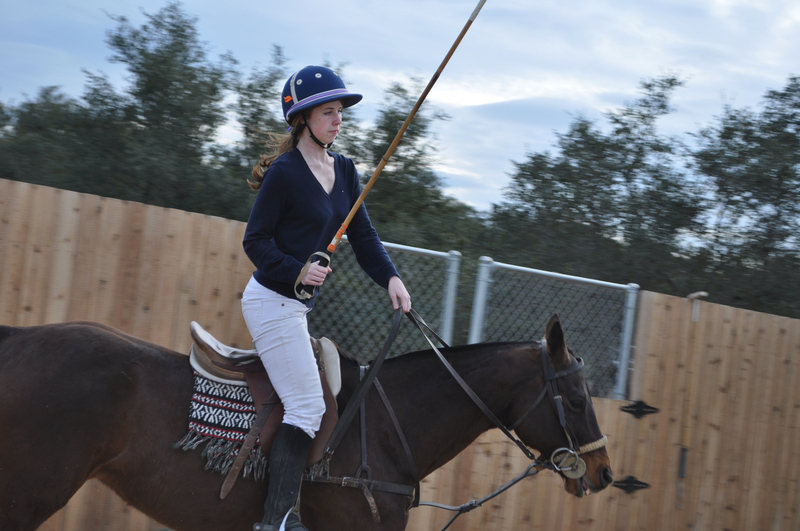 She treks 40 minutes to Dripping Springs, tacks up her horse and practices her favorite sport--polo. After her workout is done, Hiatt leaves the stables and heads back to the University of Texas at Austin to start her classes for the day, after classes, she heads to her job at UT Rec Sports. “All I do is school, work and polo,” Hiatt says. A sophomore economics and international relations major at the UT, Hiatt is a member of UT’s Polo Club, which is officially labeled a club in the registered organization database, the club manages horses, teaches newcomers the game of polo and competes with other colleges around the country. She grew up and spent her life around horses, but wasn’t sure how that would transition into college. While walking past a UT Polo Club booth during her first semester in college, she saw on a poster that said the team was the only equestrian club on campus. “It was the only chance to see horses and ride horses, so that peaked my interest,” she says. From the first varsity practice she attended, Hiatt says she got involved quickly. “When I first started I would go out six times a week and fell in love with the horses, team and competition. Originally founded in the 1920s, the Polo club has been around on and off since and was considered a club sport. According to coach Zubair Hamir a few years ago the University decided the liability costs of the organization were too expensive, and decided defund the group and auction off the team’s possessions. A college polo player himself at Oregon State University, Hamir decided to take over and support the team on his own. “Now everything just goes directly to me,” he says about the dues and donations that support the club. 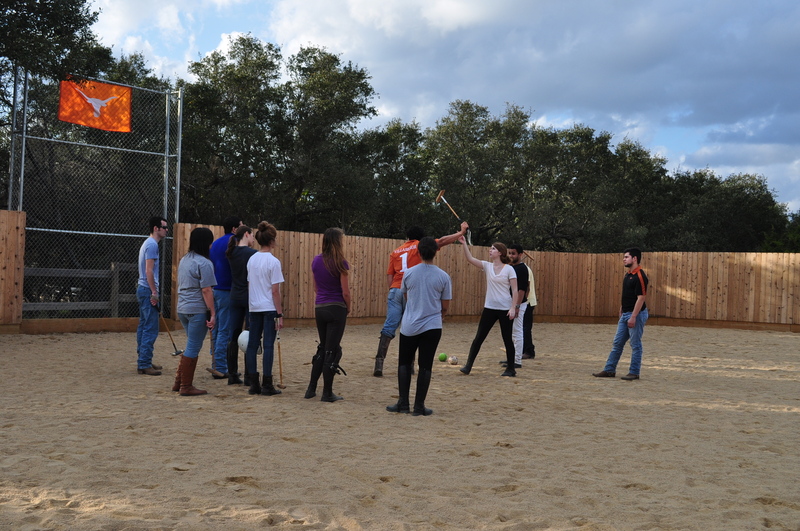 The team uses his home in Dripping Springs which houses a stable and polo practice arena. An expensive sport to play because of the costs for horse upkeep, Hamir has the students pay dues - around $500 a semester while the actual cost totals $2,000-and put a cap on the number of member the team can support. “We had to limit the number of students to 40, and we started a wait list,” he says. 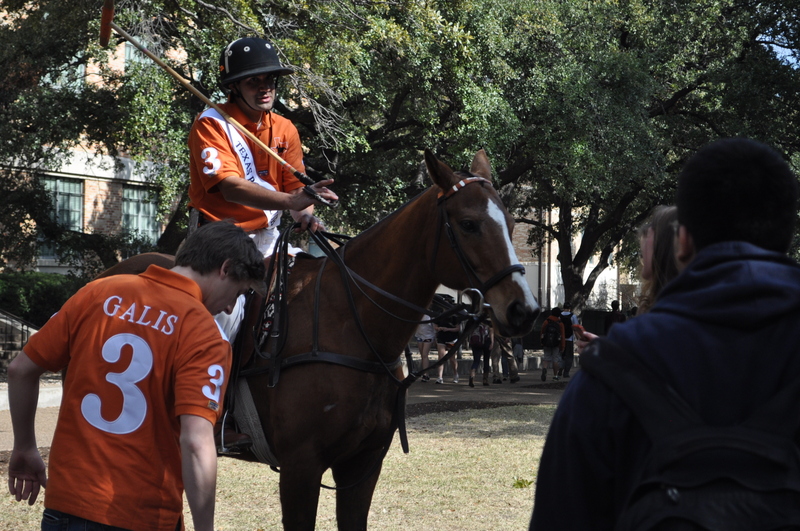 “Our club is designed to get people who wouldn't ordinarily get the chance to play polo the opportunity for a cheap price,” says UT Polo Club President Ethan Galis. The affordable nature of the college team gives students the chance to play a game normally associated only with wealthy people, Galis says. The club receives horses through donations, from owners who can’t support their horses anymore, Hamir says. Seventeen horses have been donated to the team’s non-profit organization, Texas Longhorn Polo, which Hamir coordinates. Not having university funding isn’t uncommon in collegiate polo organizations, Hamir says. Typically agriculture schools like Texas A&M get more support because they already have animal science programs, but not every top tier university program gets funding, he says. According to A&M’s team president Alejandro Molina, the polo team is listed a sport club for their university, which puts it under the Department of Recreational Sports. Through the department, the team receives $2,000 a year for costs. UT’s program is modeled after the University of Virginia team, the reigning women’s and men’s national title winners, which also runs its own program without university support through a separate non-profit, Hamir says. The UT team hopes to build a strong program similar to Virginia and have access to more donations and alumni support as the club continues to grow, Hamir says. For now, the team will continue to teach the game of polo to as many students as they can afford to. Three times a week at 6 a.m., Amelia Hiatt wakes up, gets dressed and walks out of the Castilian in West Campus ready to start her morning with a ride. She treks 40 minutes to Dripping Springs, tacks up her horse and practices her favorite sport--polo. A sophomore economics and international relations major at the UT, Hiatt is a member of UT’s Polo Club, which is officially labeled a club in the registered organization database, the club manages horses, teaches newcomers the game of polo and competes with other colleges around the country. She grew up and spent her life around horses, but wasn’t sure how that would transition into college. While walking past a UT Polo Club booth during her first semester in college, she saw on a poster that said the team was the only equestrian club on campus..
UT’s program is modeled after the University of Virginia team, the reigning women's and mens' national title winners, which also runs its own program without university support through a separate non-profit, Hamir says. The UT team hopes to build a strong program similar to Virginia and have access to more donations and alumni support as the club continues to grow, Hamir says. For now, the team will continue to teach the game of polo to as many students as they can afford to.